White to move....any predictable course of moves would have Black win the d5-pawn, arrange to push his own pawn to d4, and start making dinner plans. 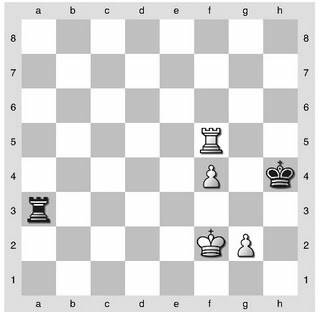 All foreshadowing aside, all seems to be going to plan... soon the b-pawn will fall and Black will roll up White's position. Again, reject the assumption! A second exchange tossed to the fire. Black is fortunate that he realizes in time that he can only, and must play for a draw. Bronstein: This game might better belong in an adventure magazine than a tournament book. 'As we can see, instead of simply offering a draw Najdorf decided to end the game with the joke moves given above, and after Kotov took the second rook he said "draw". Kotov then looked up at Najdorf with a puzzled expression: "why?" "Because it's a book draw." Nimzovich: And so I close my book and bid a friendly, I hope, farewell to you, my readers. Perhaps my favorite game in the whole tournament - one can only admire its artistry. 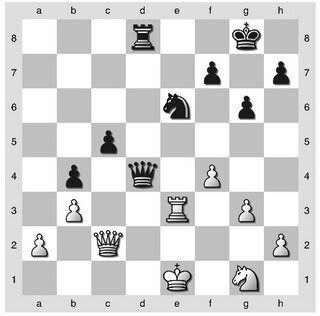 Gligoric plays out a complex blockading strategy that I think would have shocked and impressed Nimzovich himself. An odd side note - of my 20 favorite games of this tournament, the most represented players were Kotov (5 games) and Gligoric (5 games), including both games they played against each other. Despite the lack of significance this late game had to the standings of this long tournament, these two came to play, as they did for all 30 rounds. 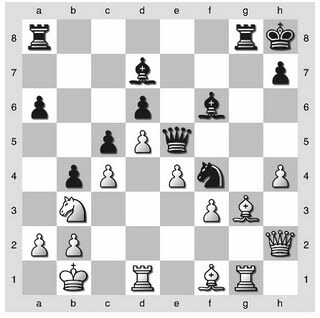 Bronstein: The black knight wants to get to e5, and White has to get it out of there at any cost, which explains his knight's retreat to its original square. 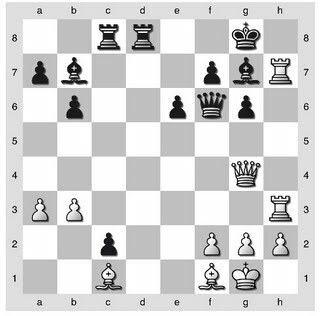 Black is hewing to a dark-squared blockade on the kingside which White must break, otherwise Black's attack on the queenside will prevail. Who will win? The knight threatens to jump to f3, breaking the blockade by supporting an inevitable e4-e5. And now the exclamation point - if the white knight wants to get to f3, Black prevents this and maintains the blockade, even at the cost of another pawn! Bronstein: A classic example of a blockaded position. 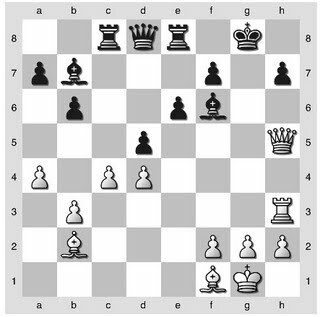 The blockade's immediate effect embraces four white pawns, but its influence penetrates much deeper: the lightsquare bishop has been turned into a pawn, the knight's own pawns occupy all of its best squares, and even so mobile a piece as White's queen is almost totally blockaded as well. 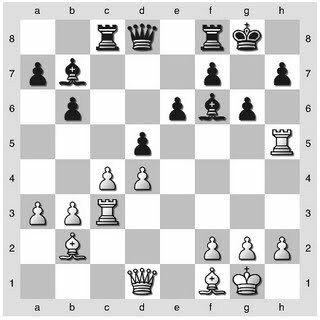 White is still two pawns up, but his light-squared bishop is not a match for its opposite number, so Black can still maintain by mixing the continued dark-squared blockade with queenside counterplay. A symmetrical blockade, now spanning both sides of the board. With no prospect to improve either position, a draw was agreed, a fitting credit to both players. Analysis diagram after 36. .... Rc3! Instead the game heads down more prosaic channels...for now. Bronstein: And here it might seem that nothing can save Black. Nevertheless, I would not have traded my b-pawn for the insignificant h-pawn. 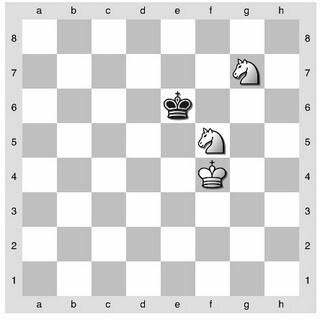 Couldn't White have relocated his rook along the seventh rank? Bronstein gives 38. e6 f6 39. Rc7! Rxb6 40. R6d7 as winning, as indeed it is. Averbakh: Reshevsky did not conceal his surprise that Geller decided to play on. With an ironic smile he sat down at the board, ordered a cup of coffee and began slowly stirring it with his spoon. 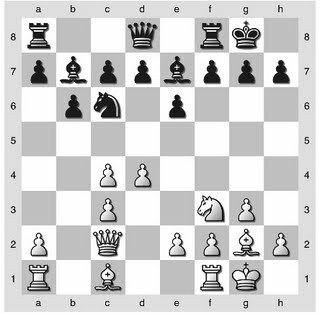 There was indeed no reason to hurry: the two extra pawns were a sure guarantee of victory. 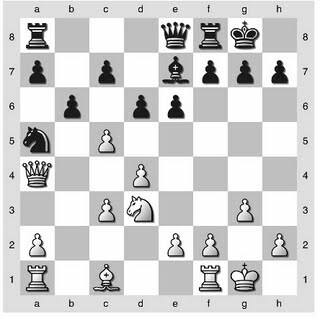 Bronstein: In order to understand what follows, keep in mind that there are some rook endings in which two extra pawns are not enough to win...sometimes it is impossible to win the ending with rook and f- and h-pawns against rook, or rook and two connected passed pawns against rook, if the pawns can be blockaded. Geller is hoping to transpose into one of these endgames. What follows is a series of suboptimal moves, each of which is individually insignificant but which lead collectively to a truly poor move. Averbakh: It can be imagined with what pleasure Geller made this move, and how triumphantly he looked at his opponent. And Reshevsky? In the seconds remaining to the time control he began thinking intensively. At that moment Geller summoned a waiter, deliberately loudly ordered a glass of tea, and the unhurriedly began stirring in some sugar. 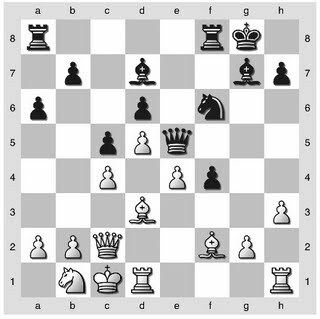 A tragedy for Reshevsky....but what about the simple 53. 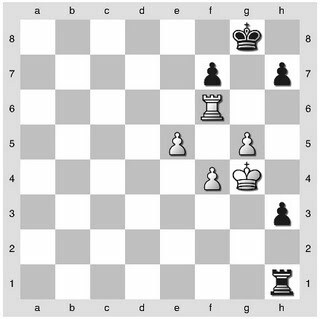 Rxg5+ Kxh4, going into a 2v0 rook endgame? But this too is drawn! 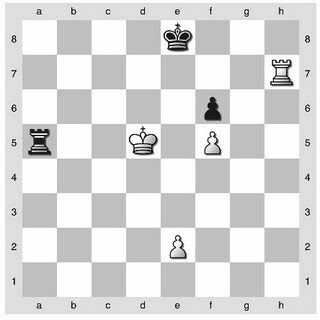 An unusual case, but with White's king cut off below the third rank, his pawns cannot advance unchallenged. 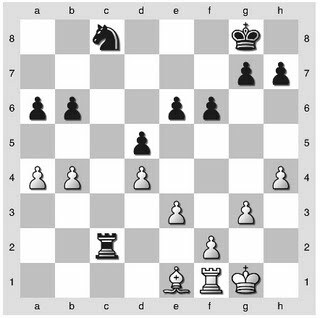 If the f-pawn advances the Black king chases it, and the combination of king and rook will blockade the g-pawn. 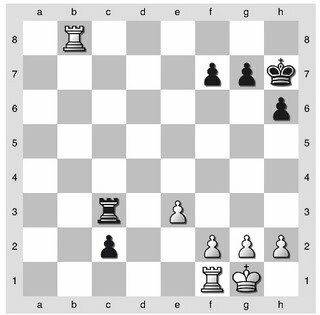 An unusual draw, requiring key conditions - connected pawns with the black king in front, an active Black rook and a mostly inactive White rook (in its worst position in front). Try this against Fritz - it's oddly frustrating. In the late rounds of the 1953 Candidates tournament, the outcome was still in doubt with Bronstein, Reshevsky, Keres and Smyslov all fighting for the top spot. In this game, Keres decided to play for the win at all costs. At what must have been an incredibly tense moment at the height of his career, Smyslov proved equal to the challenge. From an equal position, Keres designs a quick attack on Black's kingside, using the superior mobility of his rooks. A surprise rook sacrifice, equally surprisingly declined! Bronstein: Smyslov's intuition did not deceive him: as later analysis was to show, he made the best move here....Did Smyslov reason it out, or did he simply guess, as one might do in a lottery, pulling out a winning number? Only when fed this move manually did my computer find that the position is in fact winning for White! 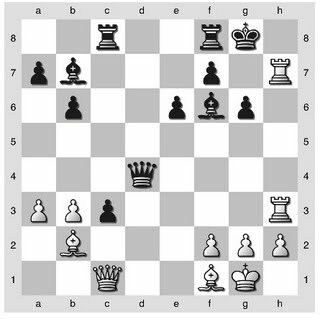 Since some of its analysis disagrees with Bronstein's, I'll leave it out for now (see the discussion thread at chessgames.com for more, or On My Great Predecessors II), but the key recognition for White is that Black's escape can be cut off after all, justifying the rook sacrifice. It may be impossible to know how much of this Smyslov or Keres saw, but it suffices to say that Smyslov chose wisely. Now there is complete coverage of the kingside, and Black can start to dream of bigger things. 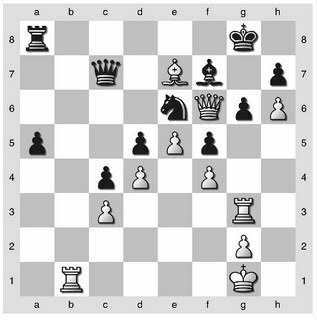 The threat of Black's passed pawn and White's lack of counterplay led him to resign in just another 3 moves (26. Be2 Rd4 27. f4 Rd1+ 28. Bxd1 Qd4+). A brilliant game, and a demonstration of accurate counterplay defeating a hasty attack. Bronstein: The reader who immerses himself in this battle's fine points, who examines the techniques used here, and who familiarizes himself with the basic ideas behind this type of ending, will have made a great stride forward in positional play. 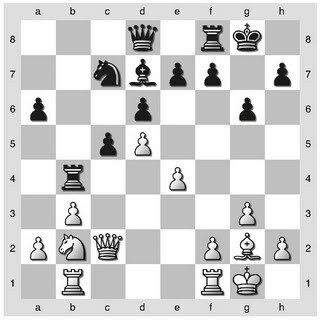 Bronstein: It is Black's task to rid himself of the isolated pawn - that is, to push it to d4 and trade it off. This, however, is impossible for the moment, due to 11. Na4. The natural thing is for Black to prepare this advance with ...a7-a6 and ...Ba7. 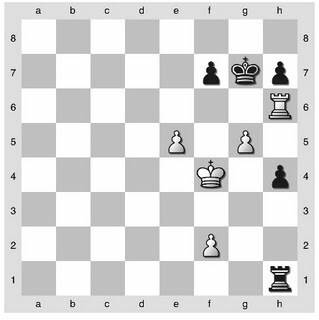 It is White's task to use these two tempi to bring out another piece to control the d4 square, intending to occupy it later on with a knight. Following this plan, one must consider 10. b3! a6 11. Na4 Ba7 12. Bb2 more logical; if then 12. ... b5 13. Rc1!, followed by 14. Nc5. 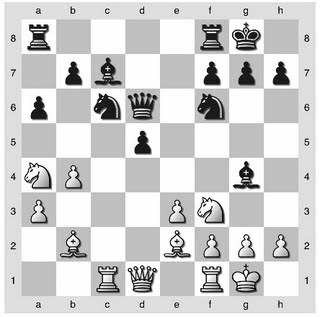 The square d4 would have remained under White's control, a strategic accomplishment of no small importance. ng this game on account of the 10th move, but Bronstein's amazingly insightful comments lay out the strategic developments of the game that follow - Black is given a temporary opportunity to liquidate his IQP and get a good game; failing to do so, he must prepare a long defense. 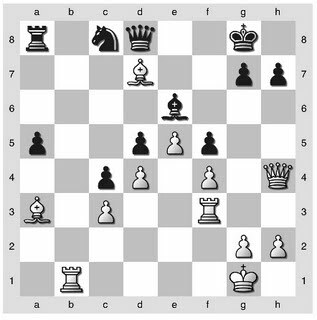 With the d-pawn set in cement, Black turns to attack as a means of liberation, but White defends accurately, and through exchanges goes toward the theoretically advantageous IQP endgame. White now has an exceptionally favorable IQP endgame, with just heavy pieces left. His pieces will be more mobile, mixing attack on the weak d5 pawn with attack elsewhere on the board. There can be only two results, White winning or a draw....but despite all his advantages it is not clear that White can force a win yet. And indeed Black accomplishes his goal - he is about to simplify to the aforementioned 4v3 rook endgame, and can have very good expectation of a draw. 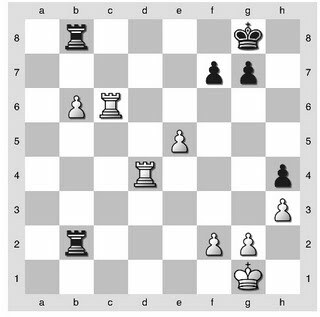 Note: a full appreciation of this endgame is beyond my pay grade - Bronstein devotes 4 pages of analysis to the following 37 moves, borrowing from the work of several masters whose combined efforts indicated the possibilities for drawing that existed at several points. However, I will try to highlight a couple key moments to give a flavor of the text. On move 39, Bronstein recommends ...Re7 with the intention of ...Re6 instead, the point being the pawn endgame is drawn. The adjourned move, and one Bronstein identifies as the key mistake - until now, the game was still drawn. Now, however, Black's lead h-pawn becomes a much easier target, and if White can win this pawn without exchanging rooks he has winning chances. 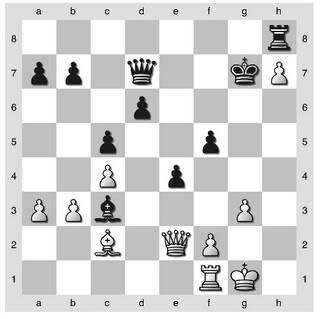 It's worth replaying the game with the link on the top of this page to see how White cleverly uses zugzwang to force Black's king to take a step back - now he can play 57. 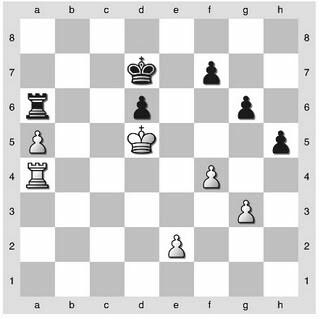 Rh6 to win the h-pawn, because a rook trade no longer leads to a drawn pawn endgame (as it would if the king were still on g7). How can White progress? 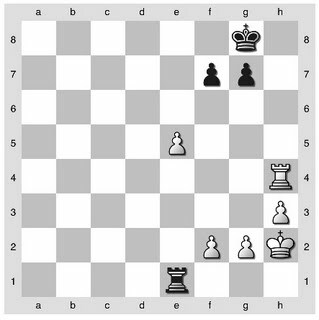 The Black rook ties his king to his f-pawn, preventing a winning pawn breakthrough. Gligoric finds the answer is, yet again, zugzwang. 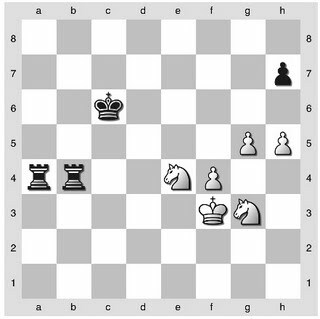 A beautiful endgame, twice White gave up his pawn advantage to improve his position, and came up with a coherent plan to which he adhered perfectly. 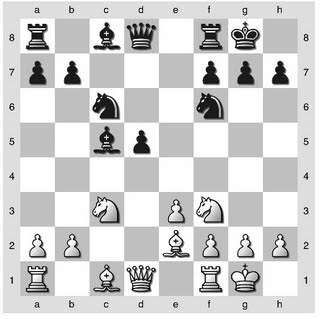 Gary Kasparov reviews Chess Metaphors: Artificial Intelligence and the Human Mind by Diego Rasskin-Gutman. Gary gives a recap of his own personal history of playing chess computers and believes that these machines are far from solving our ancient game. Gary writes, “Chess is far too complex to be definitively solved with any technology we can conceive of today.” He uses one of the metaphors presented in Chess Metaphors to explain why; “Diego Rasskin-Gutman points out that a player looking eight moves ahead is already presented with as many possible games as there are stars in the galaxy.” The one thing computers presently do is give people access to a strong player and a huge database. Kids are playing chess younger and younger with the help of computers. And being able to absorb even more of it. Earlier this month Time interviewed Magnus Carlsen who said himself that he isn’t sure if he even has an actual chess board at home! Bobby Fisher’s record of youngest GM has been broken only once in 1991. Since then the record has been broken twenty times. Gary credits computers for this. The review gets lengthy (especially on if you play chess, you must be intelligent), but if you are interested you can read it in its entirety here. One factoid mentioned that I never knew is the Kasparov match vs Topalov where it was “Man and Machine”. Both were allowed to use Fritz 5 and Chessbase 7.0. It is an interesting read found here. Gary’s tactical genius could be held in check by Topalov using Fritz and the two tied the match with 3 points apiece. Enjoy! PS Where are the keys at?! Why Do In One Move What You Can Do In Ten? 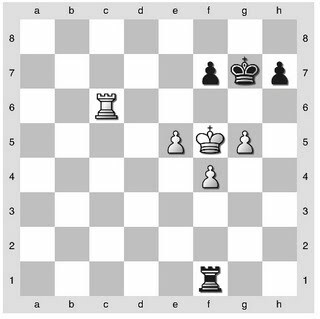 The title line is a paraphrase from Silman's Complete Endgame Course, the idea being that when you have a lasting positional advantage in the endgame, slow maneuvering can be at least as effective as going for the quick kill - sometimes your opponent will crack under the pressure. Or, as in this case, you're just savoring the experience. 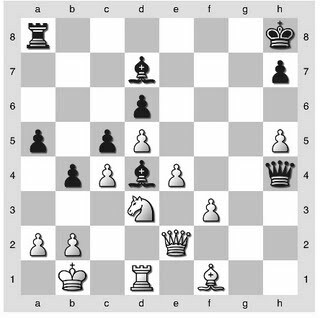 Bronstein: ...Here, by moves 12-15 [Averbakh] had already visualized the coming knight vs bishop endgame, and did everything possible thereafter to assure his knight of the best working conditions for its struggle against the bishop. 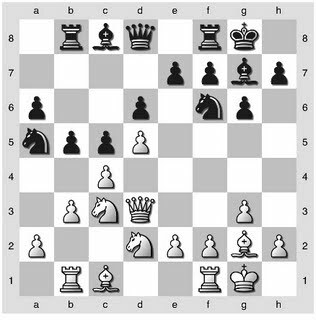 We know the knight is strong: a) when the pawns are fixed, b) when it has points of support, and c) when the enemy pawns are on squares of the same color as his bishop. 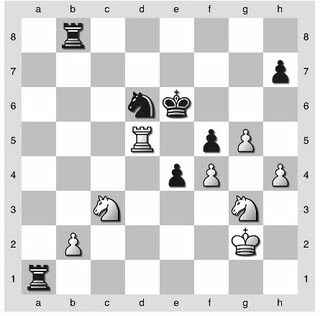 Bronstein: White has an unenviable position - but why? 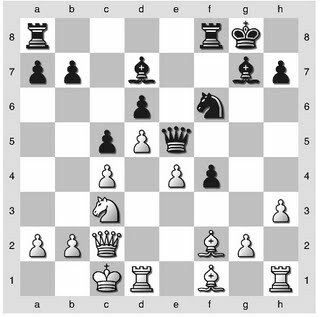 2) White's position contains a gaping hole at c4, which Black will find perfectly fitted to his knight, and perhaps to his rook as well. 3) the darksquare bishop is passively placed - compare it to Black's! ...of course, Black cannot hold onto all the advantages his position contains, but he doesn't need them all in order to win. Shortly White eliminates his weakness at c3, but only by entering precisely the sort of endgame Averbakh has been striving for. More pawns were soon to drop. Najdorf did not enjoy his stay in Averbakh's sweatbox. Taimanov comes up with an original plan to try to crack the Nimzo-Indian, which had served Black very well in this tournament. To free his bishops White clearly wants to play f3 and e4 (as he virtually always does in the Nimzo-Indian), at which point he would stand better because of the bishop pair and open lines. 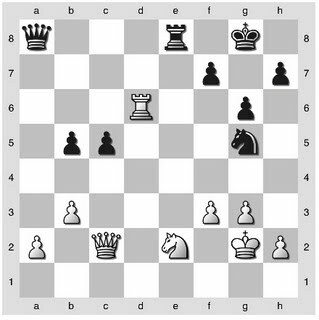 Here one crimp to that plan is the knight on c6, which White spends time to eliminate. Bronstein: In no other Nimzo-Indian was White able to get in e3-e4 so quickly and effectively, opening diagonals for both his bishops at once. The slightest misstep from Black could result in his king's falling under a powerful attack - Qh4 is already threatened. Bronstein points out 15. .... f5! as a remedy, a difficult but necessary and indeed good move to make. In response to White's aggression Black should counter in the center and try to put his transient lead in development to use. Bronstein supports his analysis with several variations, but more importantly what is the alternative? The move played seeks to shut down lines and create a defensive wall, but surely Yaacov would cringe at the sight of the forlorn Black bishop - Black is playing a piece down already. 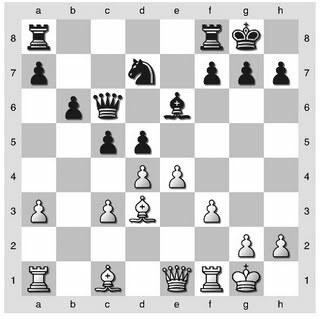 White is so dominant he can even sacrifice his queen here, getting rook, bishop, pawn and connected passers for his trouble. It's probably not so often a defensive master like Petrosian gets punk'd, but there it is. After some non-optimal opening play by his opponent, Boleslavsky hears the ever-present battle cry of the King's Indian player, 'Forward! ', and prepares to assault the center. An interesting moment - Bronstein suggested 14. bxc4 followed by exchanges of heavy pieces on the b-file as the best way for White, leading to a likely draw. 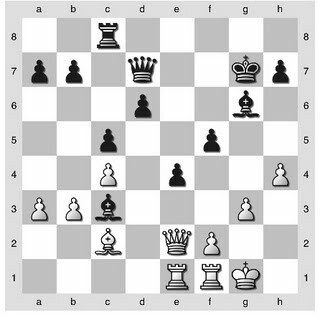 White maintains dynamic chances for both sides, choosing instead a pawn structure that orients White toward a center and kingside expansion. Black now has room to operate on the queenside, and he leverages this to put pressure on the center. 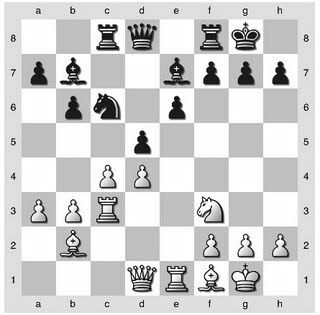 The knight will go to c7 to put pressure on d4 and prepare ...e6 while the rook works the b-file. The battle rages in the center - Black has the d4 square under increasing control, whereas White's possibilities have to lie in a dynamic pawn break. 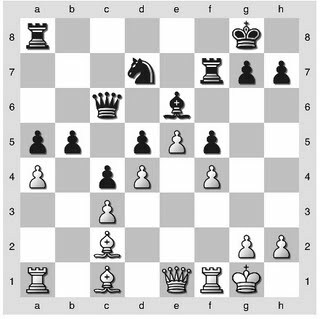 Bronstein: The most cursory inspection of the position will show that Black's pieces hang like clouds over White's position. But how to turn this to account? 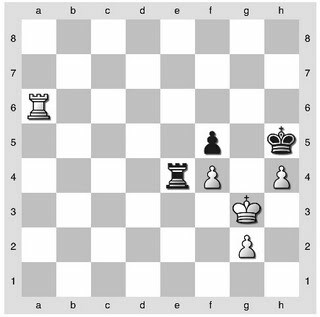 Boleslavsky wants the key to the white fortress: the e-pawn. 29. Kg2 Nxe4 (Shredder likes 29...Rxe4 much better for interesting tactical reasons: 30. h4? Qa8! 31. Kf1 Rxh4!? 32. gxh4 Qh1+ and ...Nh3 as one possibility. However, this move would have been hard to calculate, at least for me). Bronstein: Kotov has won his pawn back, but Boleslavsky relentlessly turns to attack the next pawn on the diagonal, at f3. 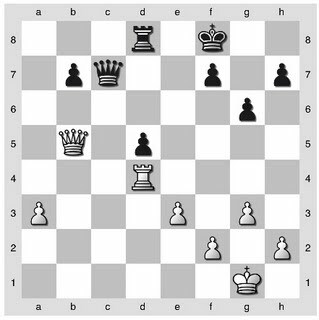 What happens if this pawn falls, or moves on? Behind the pawn on f3 stands the king, which Black has marked down as the next and final target of his attack. 33. Qd2 b4 (this move does so much - fixes a2 as a weakness, claims the c3 square and hems in the white knight. 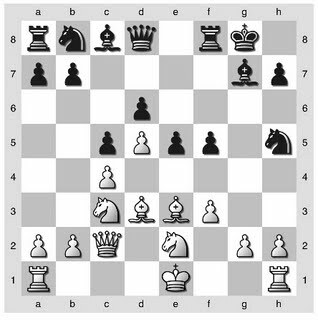 It leaves a backward pawn, yes, but if I can borrow Bronstein's logic from other games it seems to me that the weak c5 and a2 pawns are not equivalent - the c5 pawn can be supported by a centralized knight which itself has an excellent outpost supported by f6. 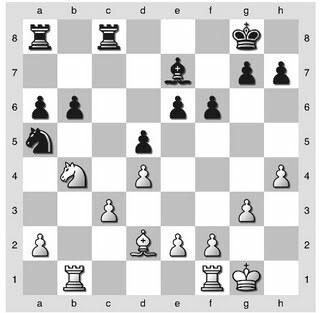 The a2 pawn will need the attention of the White army). 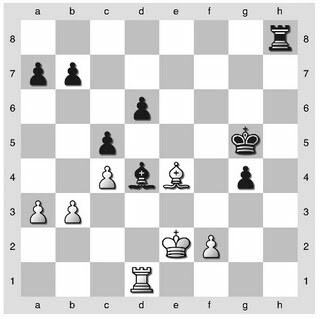 And the a-pawn falls; with the White king so exposed his position starts to collapse, though commendably White held out for another 26 moves before resigning. What I love about this game is that, in retrospect, Black follows one plan consistently and without deviation. 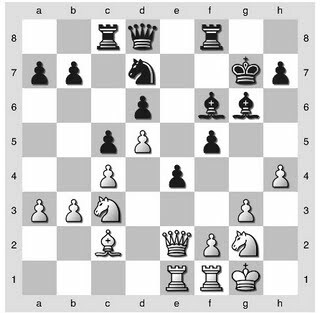 A few careless moves put White in a bad situation. In this game Stahlberg, who ended up as the 1953 Interzonal dead-ender (no shame given the company), is very close to the better side of a draw. But Kotov finds a way to swindle him, and after the game it didn't matter whether he won by way of consummate skill or blatant blind luck (just like I did the other night in the club championship). Bronstein: ...it might seem that the maneuver ...Nd7-e5-f3+ could not be prevented. Stahlberg dissipates that illusion by means of a forcing variation. 1. 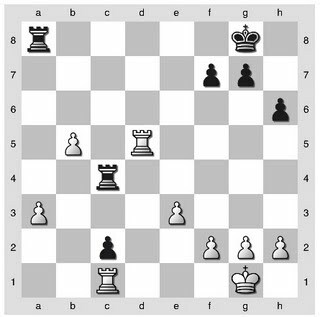 Black's bishop is well supported, and stands very well at d4, while the same cannot be said for the bishop at e4. 2. Black's king is far more active than its white counterpart, and in fact assumes a leading role in the fight. 3. 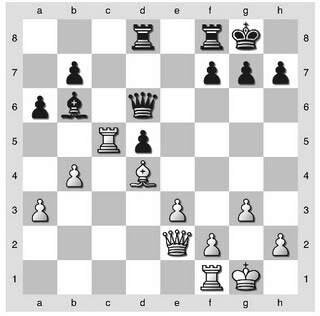 Nor are the pawns on f2 and g4 equivalent: where the pawn on f2 is weak and needs protection, the pawn on g4 stands ready to assist its pieces in their assault on the pawn on f2. All of these advantages would lose their importance if White could just manage to get the rooks traded off, but he can't. The game's concluding phase is most instructive. Bronstein: Stahlberg...denies the black rook entry into his camp. Were it not for the passed g-pawn, that might have been enough to save the game. 55. 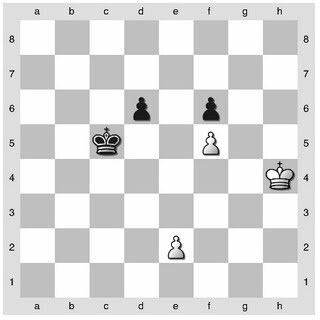 Rf7+ Ke3 (The decisive inroad by the black king). An interesting game on many levels, its analysis occupies a full five pages of Bronstein's book. Here we'll focus on the endgame, which is about as instructive as they come. 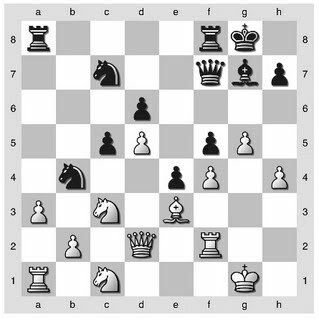 Bronstein: ....this endgame, played with a high degree of skill, certainly belongs among the best [rook endgames]. 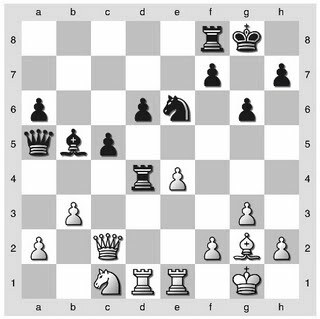 Black's task is a most difficult one: he has to cope with an outside passed pawn. 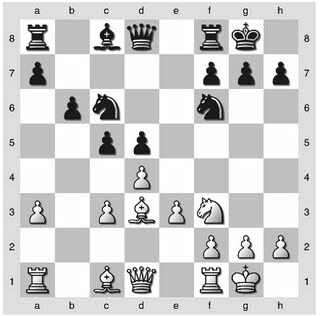 He does have counterchances, however: the possibility of quickly creating a matching passed pawn on the h-file, and the fact that there is so little material left on the board. 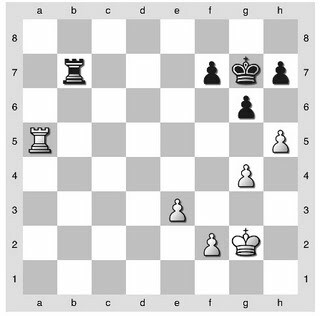 This latter circumstance sometimes allows one to trade off all his pawns, give up the rook for the last of the enemy pawns, and then force one's opponent to repay his debt in the same coin. 42. Kd5 h5 Both sides have moved their kings toward the weak d-pawn and the crucial a-pawn. Now Black hopes to create counterplay by creating a passed pawn of his own. White moves to establish control of f5 as compensation. Euwe exhaustively proves that the counterintuitive 48. .... Ra7! is the drawing move. Why? (Buy the book!) 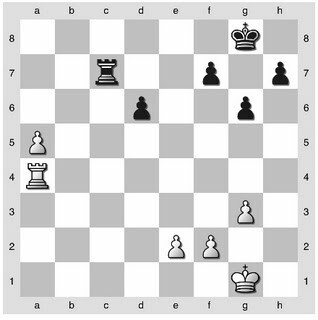 The short version is that the White pawn advances only to a6, and in variations where the passed pawns are 'exchanged' there is a draw, but now the pawn goes to a7, and if the white rook is on the h-file and black plays ...Rxa7 then Rh7+ will win the rook. Not easy stuff, missed by a GM at the board. But how does White win? 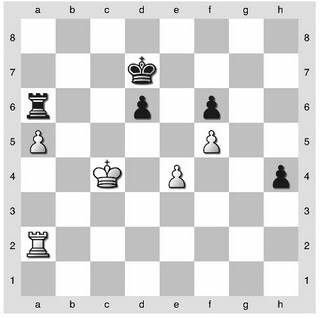 And black resigned in a further 9 moves - the f-pawn is doomed and White's protected passer goes for the endzone. A beautiful endgame, and one with subtlety.